In 2017, most of my photographic activities took place in Southern Africa, and so most of the pictures I submitted to the VTNÖ competition 2017 were from that area. You can imagine my surprise when my picture ‘Lost in Space’ from back in 2015 was announced as ‘Highlight’ in the ‘Composition and Form‘ (Komposition und Form) category. If you are interested, here are the winning pictures. The newcomers did a great job in pushing the limits, and were awarded with well-deserved prizes. Congratulations to all winners and especially to Bernhard Schubert for being the Nature Photographer of the year and to Robert Haasmann for his wildlife picture of the year 2017. I took this picture in late October 2015, after the leaves started turning yellow and brown. We walked along a side arm of the Danube river, very early in the morning. It was still too misty to take meaningful landscape shots, so I started looking for close-up opportunities. 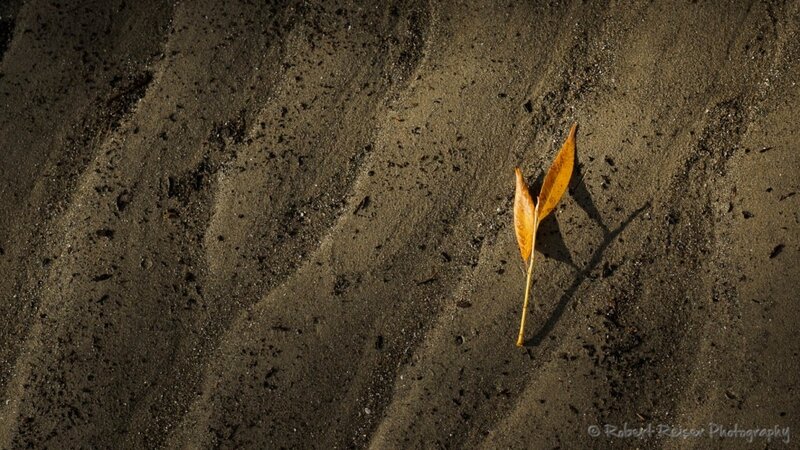 After scouting the area, I found this isolated yellow leaf, lying on a pattern of sand created by floating water. The sun started to peek through the clouds, and the leaf casted an interesting shadow. I tried multiple shots with and without a diffuser to see which version I like better. In the end, I decided to include the shadow, because I felt it would add more depth to the picture and it did somehow repeat the wave pattern of the sand. There was not a lot I did to the picture in Lightroom, just a slight increase of saturation and shadows. The other thing I did was to apply a 16:9 crop. I felt that the widescreen format emphasizes the diagonal wave pattern even further. This was the version of ‘Lost in Space’ which I ultimately submitted to the competition.